After two poorly-received eighties-style synthesiser-dominated albums in "Empire Burlesque" (1985) and "Knocked Out Loaded" (1986), plus another critically-panned one in the bluesy "Down In The Groove" (1988), Bob Dylan, supposedly washed-out and past it, surprised everyone by coming up with a classic. After this album, came another comparative clunker in "Under The Red Sky" (1990). All very odd. It was, indisputably, though, his finest album since 1983's "Infidels". Dylan employed the services of Daniel Lanois, who had produced the phenomenally successful "The Joshua Tree" for U2. The production was quite deep, bassy and haunting and matched Dylan's mostly sombre-ish, introspective material. Conversely, however it kicks off with the toe-tapping, lively, rhythmic romp of "Political World", which sees Dylan's band on top form, at a frantic rocking pace. The sound quality is also excellent, having been remastered as part of the HDCD series. "Where Teardrops Fall" is a beautiful, yearning slow tempo song with a country twang to it. "Everything Is Broken" sees a return to the bassy, almost Cajun rocking tempo and it is a most addictive song. The bass is a big and thumping, there is also some superb harmonica and Dylan's voice is strong and confident, as he tells us how "everything is" indeed, "broken". Lanois's production has brought a warmth of sound and a powerhouse solidity of a backbeat. There is nothing muddy or undercooked about it. A personal favourite of mine is the plaintive "New Morning"-esque, piano and organ backed "Ring Them Bells". 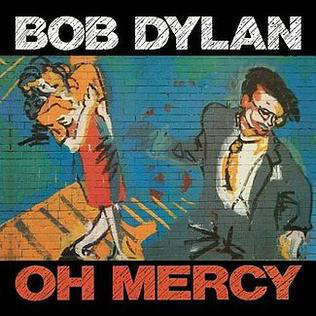 Dylan's voice is sad throughout the song and developing that appealing ageing croak by now. The mysterious and laid-back swamp blues-ish "Man In The Long Black Coat" is an excellent track, full of that musical homage to Americana so loved by Dylan, complete with Southern crickets chirping in the background. It is a superbly atmospheric song, overflowing with imagery and marvellous characterisation. It is as good as some of the material on "Blood On The Tracks", the first time that could be said for a while. "Most Of The Time" continues the low-key but portentous feeling and has Dylan self-contemplating and philosophical, staring into that deep, dark mirror. Some U2-style reverb, bass and guitar licks in halfway through. This is such a reflective album, very much in the "Blood On The Tracks" style. The gorgeous, evocative, lyrically cutting "The Disease Of Conceit" is possibly the best track on the album. Superb. Dylan is almost back into his late seventies preacher mode here. There is lots of religious imagery throughout the album, but it lacks the often off-putting didacticism of the "Christian albums". The same applies to the self-analytical "What Good Am I?". "What Was It You Wanted" is a shuffling, bassy, throbbing wonderfully atmospheric number once more. This is as good as Dylan had been for six long years. It had all briefly come together on this one. The romantic and utterly beautiful "Shooting Star" ends what had been an excellent album on a positive note. "Return to form" is a much-used, irritating cliche that, for once, held true here.